Figure 1. 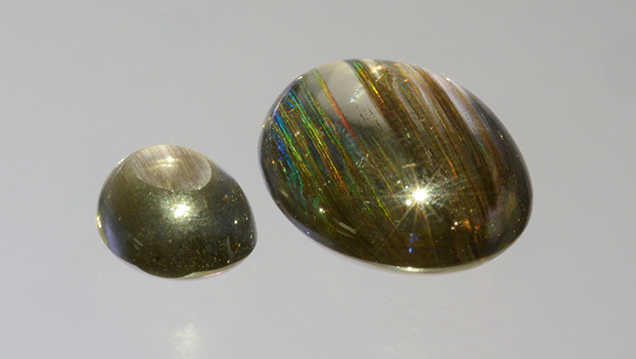 These two scapolite cabochons (7.30 and 30.22 ct) displayed prominent iridescence in reflected light. Photo by Don Mengason. GIA’s Carlsbad laboratory recently examined two cabochons from L. Allen Brown (All That Glitters, Methuen, Massachusetts) that exhibited prominent iridescence in reflected light (figure 1). Standard gemological testing of the 7.30 and 32.22 ct specimens revealed a spot RI of 1.55 and a hydrostatic specific gravity of 2.67. Fluorescence was inert to long- and short-wave UV light. The stones also showed a very weak reaction to a strong magnet. Under magnification, the most distinctive internal characteristic was the presence of dark brown exsolution stringers of a secondary mineral. Larger tabular dark brown crystals were also observed (figure 2, left). Under reflected light, these exsolution stringers proved to be the source of the iridescent colors (figure 2, right). Similar material has been reported to occur in India, by G. Choudhary (Spring 2013 GNI, pp. 58–59), but the identity of the phenomenon causing inclusions was not determined. Figure 2. Dark brown exsolution stringers of magnetite (left), also viewed with oblique fiber-optic illumination (right), were the source of iridescence in this scapolite. Photomicrographs by Nathan Renfro; field of view 4.37 mm. Raman spectroscopy confirmed that the stones were scapolite. To identify the color causing inclusions, the smaller stone was selected for destructive testing. Windows were polished to expose some of the inclusions to the surface of the stone. The exposed surface of the inclusion showed a metallic luster (figure 3), which was identified as magnetite by Raman spectroscopy, and was explanatory of the magnetic reaction observed. Figure 3. Under reflected light, the exposed surface of the inclusion showed a metallic luster. Photomicrograph by Ziyin Sun; field of view 0.25 mm. Laser ablation–inductively coupled plasma–mass spectrometry (LA-ICP-MS) analysis was used to further support the identity of the inclusions. 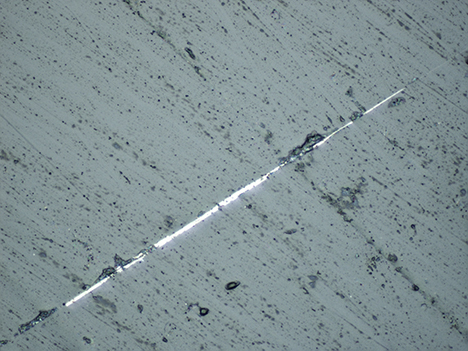 While the exposure of the inclusions on the stone’s surface was too small for a clean analysis without a contribution from the scapolite host, the results showed a significant increase in iron as the laser ablated through the brown inclusion and decreased afterward. Scapolite occurs in a number of rock types as a product of regional metamorphism or metasomatism. The close association of magnetite with scapolite has been noted before, particularly in some skarn deposits and some hydrothermally altered volcanic formations (J.A. Naranjo et al., “Subvolcanic contact metasomatism at El Laco Volcanic Complex, Central Andes,” Andean Geology, Vol. 37, 2010, pp. 110–120). Choudhary reported similar material, but the inclusions that caused the iridescence were not identified. This scapolite with iridescence, also known in the trade as rainbow scapolite, is a very interesting example of a phenomenal gemstone. Ziyin Sun is a staff gemologist, Nathan Renfro is analytical manger of gem identification, and Aaron Palke is a post-doctorate research associate, at GIA’s lab in Carlsbad, California.